The Space Gamer received three Origins Award nominations for Best Professional Roleplaying Magazine (in 1981, 1985, and 1986). The Space Gamer won an Origins Award for Best Professional Roleplaying Magazine of 1982. 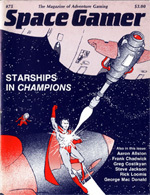 Space Gamer began life as a paper magazine published by Metagaming Concepts in 1975. Steve Jackson Games took over publication with issue #27 (dated March/April 1980), and ultimately published 50 issues (plus six issues of spin-off magazine Fantasy Gamer). Issue #76, September/October 1985, became Steve Jackson Games' last issue before the rights to the name went elsewhere. Space Gamer covered all aspects of hobby gaming: RPGs, wargames, card and strategy games, and more. It also featured industry news and reviews. Although Space Gamer is still a great read in its own right, today it's also a fascinating look at an earlier era of hobby gaming. All the issues of Space Gamer that were published by Steve Jackson Games are available digitally at Warehouse 23, including a bundle of all 50 issues. Have you ever envisioned a magical portal that you'd be able to look through and enjoy the entertainments and delights of yesteryear? Well, imagine no more! Simply pick up a copy of Space Gamer #75 (cover date July-August 1985) and get a fun-filled glimpse at the gaming world's earlier days. In addition to the regular game reviews, news, and letters, this issue includes designer's notes for Twilight: 2000; instant starships for Champions and other Hero Games; "The Hellgate Society," an evil agency for modern-era RPGs; a featured review and variants for FASA's Battledroids game; and more.